Do you want to fund the lawsuit? Israel has passed a new anti-spam law requiring senders to only send opt-in email, according to the Jerusalem Post. Whereas emails sent to Yahoo! webmail subscribers in the past were appearing fine, recently it seemed like the rendering had changed. Paragraph spacing was now totally removed from many emails. Lucas Weber tested two methods to fix Outlook 2007's rendering issues - he has not found a conclusion yet. Hopefully detailing these tests will save you some time and frustration. border styles, either inline or in the head of a document, do not render in Outlook 2007. MarketingSherpa is looking for email marketers who can share their own experiences, campaign war stories and lessons learned at their 4th annual Email Summit & Expo '09. Deadline: June 20th. Last week, MediaPost held its Email Insider Summit on Captiva Island in Florida. Chad White summarizes his insights and learnings from the event. June 19 @ 10:00am CDT / 16.00 UK - Organizing email marketing success has never been so challenging. David Daniels talks about JupiterResearch's latest research on tactics to optimize enterprise email marketing deployments in a multi-channel environment. E-mail has become the top medium for direct marketers, judging by Direct’s annual forecast survey. Of the firms polled, 72% send e-mail to customers, a 10% increase over 2007, and 50% to prospects, a 9% hike. Furthermore, 55% of those who use the medium plan to increase their budgets for it next year. Direct mail, while declining, remains a strong second. Of those polled, 66% are sending mail to customers this year, a 4% drop from 2007, and 59% are mailing to prospects. That number is 1% lower than last year. In addition, 37% of those companies plan to spend more on mail to customers in 2009, and 39% on mail to prospects. Other online channels have also gained in usage. The survey shows that 39% of those polled conduct search engine marketing, a 10% increase over 2007 and 41% advertise on other Web sites. However, that number is flat from last year. In addition, 25% conduct affiliate marketing, a 4% increase over last year. Traditional media appear to in decline. Only 7% advertise on radio (down from 10% last year). And 16% buy direct response space (down from 23%). Inbound telemarketing is used by 17%, down from 21% in 2007. And 20% conduct outbound calling—the same as last year. Meanwhile, card pack usage rose four percentage points to 10%. But statement stuffer use fell by half to 9%. In this video, Bronto's DJ Waldow and Kimberley Snyder discuss the importance of utilizing subscription landing pages to “sell” and ultimately “seal” the subscription. Read more about creating compelling subscription landing pages here. In this article Mathew Patterson discusses the technical, design and information elements that make up a successful HTML email. Read the full article on the Campaign Monitor blog. When designing your newsletter always keep in mind the amount of time you can expect your reader to spend viewing your newsletter. Everyone today is information hungry, but always in a hurry. How you display your content within your newsletter can capitalize on this assumption. Announcements: Include recent information about your company and/or products that impacts your readers. For instance, you can include a link to an upcoming tradeshow where your company will be exhibiting or perhaps a seminar that your company will be sponsoring. Case Study: Provide an example of a client who has achieved great results while using your products or services. This will help build credibility with your readers. Again, provide a link where your readers can view additional case studies. Those are three key items to include in your newsletter. If you include these, you are keeping your readers up to date on recent information about your products or services, including an article providing value on topics affecting them and by providing a case study you are proving to your readers that others are achieving success by using your products or services. Think of how we read newspapers; the same holds true for how we read material on the web. We skim headlines looking for something that interests us and only then will we begin reading an article. We also stop to view photographs and any visual cues offering greater insight as to the information held within an article. I see far too many articles within newsletters that are very long (greater than 900 words). When writing your article try to keep it at 800 words or less and break each section into smaller, easy to read blocks with bolded headlines over each section. This will encourage your reader to skim your article and stop at each section they find interesting. If you are finding it impossible to trim your article simply find a good point within 800 or fewer words and provide a link to a webpage that contains the article in its entirety. Always give your readers a reason and a means to share your newsletter with others. By providing valuable and relevant content to your subscribers, they will be inclined to share this information with others by forwarding your newsletter. Most email marketing platforms provide a "Forward-to-a-Friend" feature that inserts a link within the footer of your message allowing your readers to easily forward your newsletter. The goal is to obviously reach out to as many people as possible by providing valuable, relevant, timely content and an easy way for your readers to share this information with others. A while back someone raised a question on the Email Marketer's Club: 'Can we re-activate bounced addresses?' and I thought it would be a good thing to share the the numerous reasons why not to do this. It can negatively affect your brand. If the recipients haven't received any communications from you in a couple of years, then they can question why you are sending emails to them and report it as spam - this can affect not only your IP's reputation (which your ESP won't be happy about) but also it can get your domain listed. This in turn will reduce your deliverability so that you no longer are able to be delivered into the inboxes of your active database (thereby actually damaging your existing active database). Also, the fact that most of these addresses will be likely be inactive (and some may possibly be spam traps), will also raise the red flag to the ISP's, which in turn will reduce your reputation and possibly cause you to be blocked. Legally, resending to bounced addresses is not an issue (assuming you originally had permission to send to them) - it's more the age of the addresses and the problems this can cause. Adam Covati from Bronto also recommended that if you must restore addresses, don't restore anything that hasn't been sent to in the last 6 months. For those you do restore, you should send them a re-subscription notice so they understand why they have experienced a gap in sending. Everyone makes mistakes, but it's how you handle them that will leave a lasting impression on your audience (either positive or negative!). Email as a medium is prized for it's quick nature--though when you rush through preparation, the likelihood of errors increases. With email there are basically three routes you can take when you've made an 'uh-oh'. The correct method usually depends on the severity of your error. Leave it be - Perhaps you've spelled something incorrectly, used the wrong title, typo in the subject line, made in error in the personalized greeting... These are usually embarrassing blunders, but honestly not worth taking any action on. In this case, sending an apology/correction email is likely to either draw attention to the error to those who may have not noticed or even annoy subscribers who may have not noticed/not cared about the error. Move on and learn your lesson for the next one! Make good with some - In the case of an incorrect link, a strategic approach to fixing the mistake is to contact only those who attempted to click on the link. Again, for those who did not click on that particular link, you are just drawing attention to the fact you made an error. Especially if there are many links in the email, it's likely not crucial that everyone know you made a mistake. Worried future clickers might miss the message? Set up a mailing to trigger the message each time someone tries to click… Your ESP probably has this capability-ask if you're not sure. Another side of this is to subtly apologize or correct your error in a future mailing. Mass apology - Although I believe sending more email should be avoided, there are circumstances--such as the inspirational email for this post--where it's absolutely necessary to send a correction email. In this particular case, a national retailer was holding a contest; it selected finalists for each region and sent those people an email to invite them to the private party for finalists. I think you can see where I'm going with this… EVERYONE received the finalist email for one region. I'm sure chaos ensued for this poor retailer--who issued an explanation and apology email within half an hour of the first. Certainly the right course of action, except, the email simply placed blame on the email service provider for the error. While I don't doubt the ESP was responsible, given the nature of the error it would have been appropriate for the retailer to take responsibility and provide a peace offering (we're so embarrassed-we're giving you a 10% off coupon) or some other sort of small gesture. Truth be told-this probably would have resulted in more sales than the contest anyway, and it would pay for itself pretty quickly! If you make a mistake, chances are your subscribers will only remember how you handled it. If you take no action when necessary, then you don't care. If you apologize for something trivial, you're annoying. It's a fine line, so planning your strategy before it happens will ensure you make the right choice in the heat of the moment. Hopefully it's one strategy you will never have to use! The Email Insider's Summit was fantastic and one of the sessions held looked at all things mobile and in particular designing for the mobile. But before we have a look at these facts and figures, I'd like to make a special note of Chip House of Exact Target's pertinent remark in his session of 'Subscriber Rules', which was that carrying mobile devices makes receiving an email more personal now...more so than receiving it on your computer. This has always been the general feeling about SMS/text marketing and now it is also becoming applicable to mobile email users. Therefore the potential for annoyance increases as it affects their personal space. So, the key of course to this, is to engage with the subscriber and ensure they are receiving what they want, when they want it. Deirdre Baird (Pivotal Veracity) and Morgan Stewart (Exact Target) brought forth some facts, including that 52% access same email account through mobile and computer and 48% maintain a unique mobile email address. so...how do we design for the 48% who are not going back to the office to veiw their emails in pretty HTML? Designing for images off is now the norm for inbox emails, this also needs to be the norm for designing for mobiles. Calls to action need to be easily accessible at the top of the email. Keeping in mind that according to Jupiter Research, 48% of recipients have 'add to address book' at the top of the email and 60% have 'click to view' up there as well, the downside to this is that mobile's window area is taken up with these links rather than call to action or branding or having something which compels readers to scroll down. Important to check how email renders in variety of mobiles. 640pi wide is the magic number. B2B need to use a single column layout for mobiles otherwise, depending upon the mobile, you either scroll right or it places the right below the left column. Weight should be a maximum 20kb with images. Urls - Symbian doesn't recognise links -it needs the full url. The Blackberry however pulls both the image url and link url. So don't use unecessary images (which includes image spacers) and make urls shorter so they take up less screen space. The bottom line is that it is an overwhelming task to get rendering correct for all mobiles out there at the moment, but if you follow the above tips, it should make for a better user experience. ExactTarget announced the results of their 2008 Channel Preference Survey at the Email Insider Summit and in a new whitepaper, How Consumer Preferences Impact One-to-One Marketing Success. The whitepaper addresses the impact of consumer communication preferences on marketing success and highlights the challenges marketers face in today’s world of multi-channel, one-to-one communications. The core component of the whitepaper is ExactTarget’s 2008 Channel Preference Survey, which surveyed U.S. internet and cell phone users over the age of 15 about how they prefer to receive both personal and marketing messages. Preferred personal communication channel is not synonymous with preferred marketing channel. 65% of those surveyed have made a purchase as a result of a marketing message received through email (the highest rate among all digital channels studied). Email was deemed the most acceptable digital channel by which to receive marketing messages. 95% of respondents have granted a company permission to communicate with them via email. Only 9% of regular text messaging users prefer SMS marketing messages to email marketing messages. How marketers can better allot valuable marketing resources. Long-term one-to-one marketing success depends on marketers’ ability to listen over time, effectively capture preferences, individualize communications and proactively adapt to the needs of subscribers. Greater success will come to marketers who give their subscribers complete control over the means and manner of marketing message delivery. Habeas released its 2008 study of consumer attitudes towards email and online interaction with businesses. The study, completed in May 2008 by research firm Ipsos, found that consumers prefer email as a primary method of communications in their personal and business capacities; they will continue to prefer email in the future despite the rise of online threats and the emergence of other communication channels and Web 2.0 applications. The report also revealed an interest from consumers in gaining more control over their online interactions with businesses and an increasing level of concern over spam and virus threats reaching consumers through their mobile devices. "Regardless of their concerns over email and online threats, consumers are becoming even more dependent on email for their relationships with each other, via social networks and Web 2.0 applications, and those with whom they do business," said Des Cahill, CEO, Habeas, Inc. "This Ipsos study illustrates the relevance and longevity email has within the online ecosystem - today and in the coming years - and touches on the role consumers want mobile devices to play." This year's research covered subjects as varied as security features and email protection, consumer abilities to identify spam, concerns about fraud, preferred modes of communications, online purchases resulting from email communications, email privacy, email unreliability and online marketing practices and reputation management. Sixty-seven percent of respondents prefer email as a communications channel over other online vehicles and 65 percent believe this will continue to be the case in five years. Consumer opinion of the future importance of email registered far above future expectations for video conferencing (19 percent), instant messaging (17 percent), SMS text messages (12 percent) and Web meetings (12 percent). Sixty-five percent of the demographic between the ages of 18 to 34, the age demographic most comfortable with IM, SMS and emerging communications methods, will favor email to communicate with businesses in five years. Sixty-nine percent of those surveyed expressed concern about being victimized by email fraud scams, a significant rise from the 62 percent finding in the 2007 Habeas report. Forty-three percent of respondents voiced concern over the spam and virus threat to mobile devices, which represents a rise from 2007's 36 percent and a sure reflection of the increasing use of the "mobile inbox" through smartphone and internet-enabled phone devices. As many as 35 percent of those surveyed do not know what to look for when trying to sift through emails that might potentially be dangerous. More than 88 percent of respondents said they would like organizations to give them more choices over the content and frequency of the emails they receive, including options on advertisements, special offers, articles, newsletters, white papers and other specific content options. More than 80 percent of participants favor doing business with organizations that use opt-in permission to send them email. Monthly emails and content and frequency options positively impacted a company's reputation. Three of every four respondents prefer engaging with organizations that exhibit strong privacy practices. Only 12 percent of respondents acknowledged making one or more purchases from businesses they did not know. As many as one in four respondents lose some degree of faith in an organization that is unable to deliver email reliably. Daily email messages ranked with pop-up advertisements as the most damaging online tactics to a company's online reputation. On average, about 80 percent of respondents are not comfortable with businesses sharing their email address. More than 80 percent feel that a business' reputation is negatively affected if it shares customer email addresses with third parties. The 2008 Habeas study confirmed the consumer "Email Insecurity Factor" findings uncovered in the 2007 study. This year's report again found that nearly 60 percent of users employ two or more personal email addresses, giving a different address to entities they do not trust while maintaining separate accounts for trustworthy sources. "Far from being eclipsed by Web 2.0 and other emerging communications methods, consumer expectations suggest that email will be the workhorse channel around which future online communications will revolve," Cahill continued. "This tells us that email will be as central to online commerce and communications in the future as it is today. Organizations that build trust with consumers by implementing forward-looking online reputation management strategies will differentiate themselves and gain a long-term competitive advantage by establishing themselves as a trusted online brand." Greetings from Captiva Island. Yes, I will be live blogging again today and tomorrow. Feel free to comment and chime in! Student 3 wakes up in the morning and checks email and Facebook first - uses the iPhone to check emails when he's really "itching for it"
Tamara Gielen - "Facebook is solely about communicating with friends and former classmates"
Tamara Gielen - Student 2 is more hesitant towards emails. "when I get an email, it's usually because somebody wants something from me"
Tamara Gielen - how do they feel about marketing messages that they receive via email? Tamara Gielen - "marketing messages via email? That's why we have spam filters!" Tamara Gielen - Student 3 describes his hobby: "I guess I like surfing the internet and go to tech blogs"
Tamara Gielen - He's kidding right? Tamara Gielen - Student 3 does not want people to target him in his mailbox, because that's "his personal space"
Tamara Gielen - Q: What would it take for Facebook to replace email? Tamara - I'm loving the play by play of the Summit! Tamara Gielen - Hi Maddy! Too bad you can't be here! I met two of your colleagues yesterday. Hi Tamara - Thx for the live feed. Tamara Gielen - the next panel will talk about privacy, policy and the industry. Jenniey Mullen, Dennis Dayman, Alan Chapell and Tom Bartel are on the panel. I agree with DJ. I don't think everyone gets that "privacy" is or entails. I think that there are so many paths you can take this discussion on that it is a deeper scenario exploration than just this panel. "we are in the process of rolling out e-delivery for all of our products. However, the rule per our legal team is that you have to notify the owner for each product they own. So if I own 13 products, I would get 13 separate emails. I think this is a horrible user experience and am wondering if there are rules or best practices on this? I know you can't opt out of service messaging, but the messages would be so similar that I think it defeats the purpose to send them separately, especially when some mail programs will combine them to one anyway (Gmail). Obviously as we become more advanced we could do dynamic content so they would get only 1 message with a list of all their products. However, I'm just trying to figure out how to manage both the legal requirements today an not inundating them with multiple email messages in a delay or shorten time from. Can you help me or point me in the right direction?" It is a really tough situation of how to approach this. When you buy another business you do buy the customer base as well. That includes email addresses. Anyone have some good ways to approach this? We try to coach our customers to be VERY careful. Message on site, send an email from the company you are acquiring before you start a relationship, but then be ready for unsubs and negative emails. They will come even if you are respectful of their privacy and do it right. There is NO magic bullet here. PR and Marketing and a strong value proposition are going to be key. Tamara Gielen - shoot... I forget to bring my power adapter :( does anyone have a dell power adapter that I can borrow? Tamara Gielen - @dylan it hurts, but it does say something about the engagement of the audience base with the company's email practices, don't you think? I do agree that it was a good approach. I actually clicked on that link years back from IBM and still get Lenovo emails. Have not bought one for a while but still get them. Tamara Gielen - next topic: "we're an online publisher offering premium content to our subscribers via our website and via email newsletters. We require our subscribers to log-in every time they want to visit our website, and to make changes to their account, unsubscribe etc. How will these new FTC rulings impact us?" I personally have HATED people making me login to manage my email preferences. Not allowing me to change or unsub is the wrong thing to do. It has been wrong long before the FTC made this ruling. Tamara Gielen - next topic: unsolicited marketing messages being sent to my Facebook inbox - does can-spam apply? Tamara Gielen - Next up is a panel on "deliverability secrets unwrapped". On the panel are David Atlas, Jack Hogan, Melinda J Smith and Spencer Kollas. The great unknown: Deliverability. To me...another one that marketers don't really get. Thoughts? Tamara Gielen - need a dell power cord in the next 30 mins... anyone? Jack knows his stuff. I just worry that FAR TOO MANY marketers don't get it at all. Brandmail is sponsoring the event TG. I have not seen it yet. uh oh...no mention of PV on this slide...uh oh. Intersting... MindComet calls their email solution BrandM@il. That could cause confusion. They are from the UK and on the way to the states now. Really need to have more than one page to have a website http://brandmail.com/ not even a contact form or newsletter opt in. http://www.brandmailsolutions.com/ - this is the CA company's site. And I thought we were the only one using the term, BrandM@il. Managing your reply-to inbox is KEY!! Tamara Gielen - new session on social media called "reaching the social community with email"
We actually use PV at Expedia. Good feedback. One of the things that I find difficult in these panels is understanding what is it that the audience wants to hear about on the subject. Agreed, we need to find a forumn that will get our IT folks engaged, AOTA is probably one option, but I don't think it reaches the network/datacenter folks broadly enough. Was it EEC that proposed volunteering to speak and non-standard conferences? Tamara Gielen - I do NOT appreciate MediaPost posting the attendee list with address details included on the web! Tamara Gielen - Gather are talking about their social network "for adults"
FB for the geritol set? As an adult, I'm primarily on Facebook and LinkedIn, also Friendfeed, Livejournal and Twitter (and less so on Myspace). I think Brandon summarized it best earlier. I'll go wherever my friends are. Tamara Gielen - Is this a sponsored session about Gather? Same here. Don't need a social network for "people my age"
Only 6! You pauper -- I have more testing accounts than that -- how else do I know if my campaigns work?!? What I really want, is something that aggregates all of my social media feeds and interactions into a single "dashboard." I'll coin a new term - PRM - Personal Relationship Management - I want to know that my friend has added a new book on their Amazon wish list, but I don't want to go to Amazon. I want that integrated into a system that also has all my emails and phone calls to that person -- and maybe comments from other systems as well (like some sick video on YouTube) -- I can see this ... now, how do I do a market capitalization? Friendfeed is a good first step. Too bad Facebook won't play nicely.... and the UI needs some improvement, but I'm getting into it. I like their concept of "invisible friends"
@RonB Once you figure out the perfect PRM solution, then can you make an awesome mobile version of it? if it ain't mobile-enabled then why bother making it? Tamara Gielen - Next session is on "performance marketing and lead generation"
Is "BeRelevant" hosted using Amazon S3? Tamara Gielen - @RonB not as far as I know, why? What do all of you think? I think that giving more than one relationship to unsubscribe from creates and opens up a larger issue. One person should own, manage and control the relationship. That's the problem with us IT/Marketing guys - we keep looking at little details. I agree also - one place - make it quick, make it secure, make it prominent to the user. I agree Dylan. One place to unsubscribe, but the option to either get all the way out or to change your preferences - including your email address. RonB - Good point @Tamara - thus far, the campaigns I create do not use advertising of any kind, exactly for that reason. DJ Waldow - relevant, targeted, timely - simple, right? DJ Waldow - Said another way...why do we spend so much time on FTC Laws, Deliverability issues, etc? It's all about relevancy, timelieness, targeted messages. Simple. Melinda - We are always at war so to speak with the advertising group about sponsored emails and banners. Yes, I get their position to have the revenue stream, but we don't want to carte blanche let them sell anything. RonB - @Melinda - hold your ground! Melinda - So, we push back and figure out *when* it's appropriate (aka relevant) to the consumer. DJ Waldow - @Melinda: you nailed it. Melinda - @DJ Waldow True, we're not considered reasonable consumers and it's a challenge to measure or know what it is the consumer want. Even if you ask them, what they say and what they do are often at odds. The Federal Trade Com­mission's just-approved new rule provisions for the CAN-SPAM Act largely place the onus on e-mail marketers and their affili­ates to take responsibility for clean e-mail lists and clear communica­tion among marketing partners. Listen to this podcast to discover how these changes will affect email marketers and what they’ll have to do differently to be in compliance. Forrester's three-step formula provides marketers with a method to determine how much the customers on their lists are worth. New FTC Rules Under the CAN-SPAM Act In Layman's Terms. Recently the FTC has approved four new rules under the CAN-SPAM Act of 2003. You can find the press release here. Contrary to what many believed they would do, the FTC did not shorten the time frame for honoring opt-outs. For the foreseeable future it will remain at ten (10) days. The FTC limited acceptable opt-out procedures to simple, one step operations, requiring no more than the user supply his or her email address and preference. The FTC modified the definition of “sender” to make it easier to determine which party is responsible for complying with the Act’s opt-out provisions. The definition of “person” was expanded to clarify that the Act’s provisions apply to companies as well as individuals. These are the most important points affecting our industry. However, the Commission’s Statement of Basis and Purpose will be published in the Federal Register in the next several weeks. It will provide a lot more guidance on what the FTC was thinking when it promulgated these new rules. MySpace has informed us that on Monday it was awarded $234 million in statutory damages, the largest anti-spam sum ever made under CAN-SPAM and apparently ever under any law. The new Speakers Bureau will match eec members with speaking opportunities at events that without our support would have little or no programming about email marketing. This morning I received an email from a retailers in which I immediately noticed something odd in the subject line. First a little background... In Canada, we have a long weekend in May around Queen Victoria Day (May 24). This weekend also usually means the start of hot summer weather after a cold and dreary winter. So naturally, it usually means packing up and heading to the cottage or camping to drink a few cold ones. 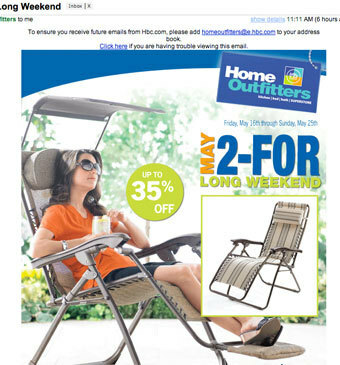 Therefore this weekend is commonly referred to as "May 2-4 Weekend"
There's really no mention of any sale or promotion, except for the 35% off circle, which has nothing to do with 2-for-anything. It's not until I scrolled down to see the "2-for-$100" text at the very bottom of the email. I guess this is more of an above-the-fold lesson--but if you're going to use a clever play on words in the subject line, make it obvious right away when the email is opened! The company sent an email on Thursday inviting people to an event at The Grove Golf Resort Hotel, Herts, an 18th century country estate. But the offer was intended only for the 75 members of its first class Traveller club. May 28, 2008 1:00 PM - 2:30 PM EDT - Learn how HTML design and rendering tactics impact the deliverability of an email campaign as well as the response it generates from recipients. New book on email marketing written by one of the industry experts: Simms Jenkins. Don't forget to check out the resource center! In this day and age of marketing via the email channel, it's becoming more obvious than ever that we, as marketers need to change our methods to keep up with our subscribers' requirements. We need to be more subscriber/customer focused and ensure we deliver emails which the subscriber wants. In return we will be rewarded with better deliverability, increased ROI and happier subscribers. Stephanie Miller of Return Path, a great advocate of the 'subscriber experience' will be Keynote Speaker at the UK DMA's Email Marketing Conference coming up on June 5th at the London Zoo (and yes, you can visit the zoo in your lunch break!). The title of the conference is: Customer focused email - marketing to people not lists.